The Federal Government’s Special Envoy on Indigenous Affairs visited Cherbourg last November and promised then that he’d return. His last visit was greeted by a small protest outside the Council Chambers, but this time it all went smoothly for the former PM. 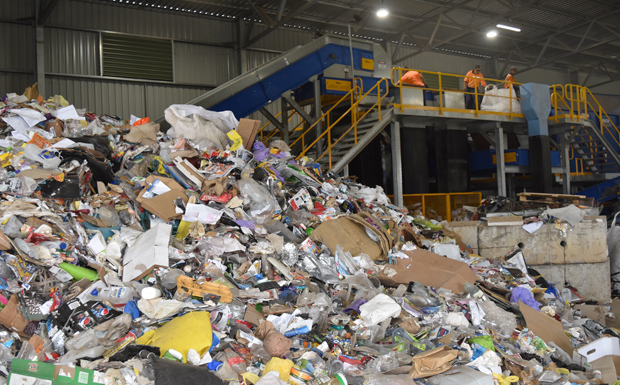 Mr Abbott visited the Cherbourg Council Chambers, the State School, Gundoo Early Childhood Centre and Cherbourg Radio on Wednesday morning before making his way to the Materials Recycling Facility. 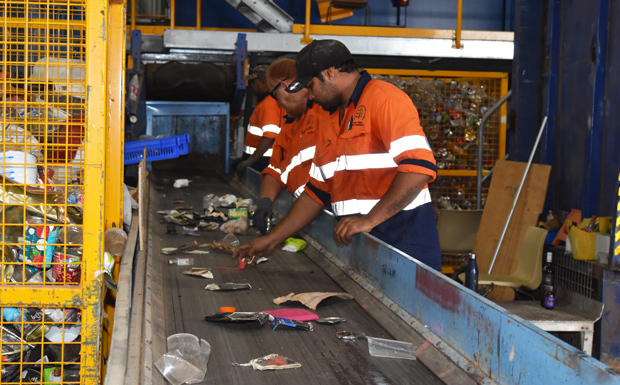 Facility Manager Andrew Beckett and Cherbourg Council economic development officer Sean Nicholson escorted Mr Abbott through the plant, where he had the opportunity of seeing the sorting machines in action. He also chatted with the workers. 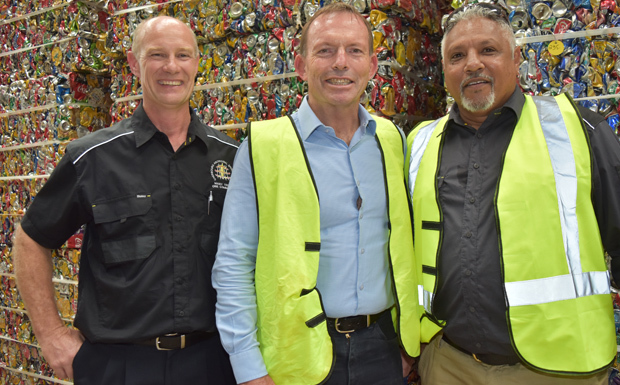 Andrew explained to Mr Abbott that the facility was currently using an old auto-tie baler generously leased to Cherbourg by Cleanaway Waste Management for just $1 a year. This machine compresses and bales sorted waste but can take as long as 90 minutes to prepare each individual bale. A new machine, bought and installed, would cost $380,000 but would turn out compressed bales in anywhere from 30 seconds to five minutes. This would substantially improve the efficiency of the plant, saving time as well as money. Mr Abbott urged Sean and Andrew to prepare a business case for the new machine and liaise with the Department of the Prime Minister and Cabinet. 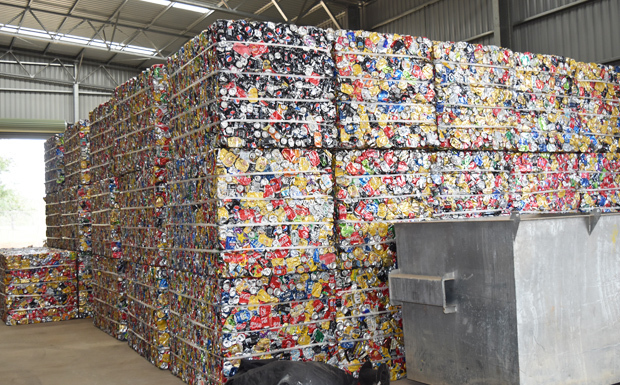 The Cherbourg recycling facility currently employs nine workers and processes 3000 tonnes of recyclable materials a year. 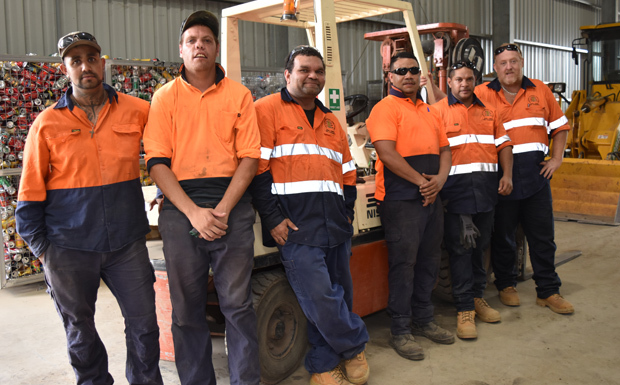 It recently received funding under Round 4 of the State Government’s Building Our Regions program which will allow the construction of more sorting platforms and storage areas. Sean said these improvements would create a huge efficiency gain in the facility and increase employment to 15. Where is all this compressed stuff going now? Who is buying it? We’ve been told that it is placed on an auction site which is used by the industry, and yes, it is being sold.